Here in Northern California, El Niño is back, so we have had waves of storm, lots of rain and a bit of sunshine peaking in between. El Niño is a warm ocean current along the pacific that reoccurs every 4-7 years around Christmas, thus the name of El Niño, the Christ child in Spanish. Still looking for a last minute gift, you may still have time to place an order. For domestic orders, December 20 is the last day for First Class Mail, December 21 for Priority Mail orders and December 22 is the last day for Express Mail for Christmas arrivals depending on location. To check transit time, go to the USPS Postage Calculator and enter 94062 as the departing zip code. 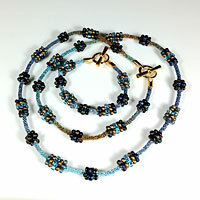 The C-Lon Tex 400 Bead Cord is well suited for these bracelets. The arrival of 16 new colors of C-Lon Tex 400 Bead Cord bringing the total of colors of C-Lon Tex 400 Bead Cord to 72 is perfectly timed. That is truly amazing to have all these color choices. It makes working with this cord a pleasure. Just added - NEW - Hamanaka Double Pointed Steel Crochet Hooks - I love them and used the 0-2/1.5-1.75 mm for most of the bracelets shown above - all made with C-Lon Bead Cord Tex 400. For breaks, I switched to the Kollage Square Hook Size B! Thank you C-Lon - the only company adding new colors of bonded nylon for us to play with. Happy Holidays! 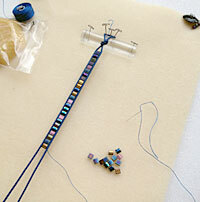 This kit creates braids with segments, intervals with fiber only and beads clusters in section. This is an area of kumihimo that has been of interest for me for a while. I have been playing around in my spare time with samples in this genre. Read my blog about playing around with segments. 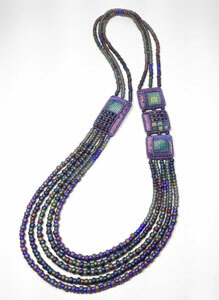 Check this new kit, it has a distinctive look and can be the base of other pieces with bead clusters and segments, mixing beads and fiber, with both remaining important elements of the final design. 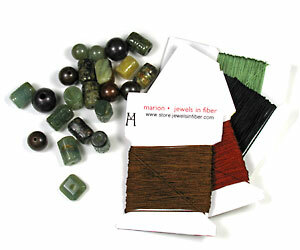 The kit is a great way to explore bead and fiber kumihimo. The ribbon is laid out, cut and tied together, so you will be braiding in no time. The tool kit includes a project bag to make it easy to take your kumi to go! 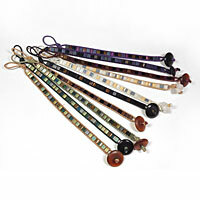 New fabulous Chinese Knotting Cord in several sizes just came in, plus additional colors of the new Micro H size. More choices creates some confusion, but it is well worth the hassle. Diversity, individuality and choice in designs is what it is all about and it can not be done with a narrow color palette or few choices as to cord size. 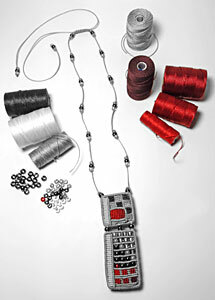 I want many choices as to colors, sizes and cord quality. I hope you feel the same way! New Colors, just added: Glacier White, Antique Brass, Chocolate. Smoky Topaz, plus Opera Red, Tahiti and Berry, shown with Night Blue and Rose. Glacier White is one of my favorite classics, Chocolate, uhm, so rich, Opera Red, great for winter holidays. Tahiti and Berry are just fun. I sold all my Tahiti samples at my last show in Capitola-by-the-Sea. I had to redo new ones for the photo shoot. A new shipment of Vintage Nylon just arrived. A few additional color of Mastex #18 circa 200-2005 were found, so if this is one of your favorite cord, check it out. New color of nylon #69 have been added. 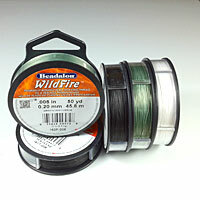 They are great to fill in for colors not available in C-Lon Micro Cord. We have to thank C-Lon - they are the only company developing new colors of bonded nylon for us to play with. Enjoy! My own twist on this modern version of a Chinese square knot bracelet. This one is out of survival due to the large number of inquiries I get. It has been on my to-do-list for a while, but of course I had to make a bunch of them, test them in the real world by seeing what my customers liked best, refine the technique and find some of my own solutions. Then the writing came in, the illustrations and the instructions had to be tested. After a few revisions and additions, it's a go. 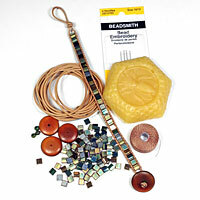 Kits are available as well as additional bead & cord packages. PDF instructions can be purchased by themselves. Silk is an amazing fiber to work with. 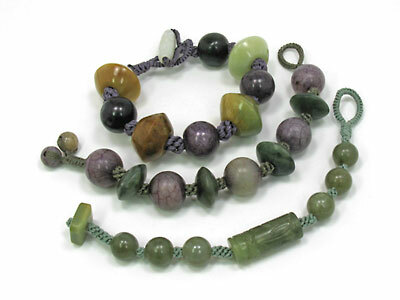 It lays so well and is particularly suited for pearls, coral, jade and other softer material as it does not damage the beads yet it is still strong. 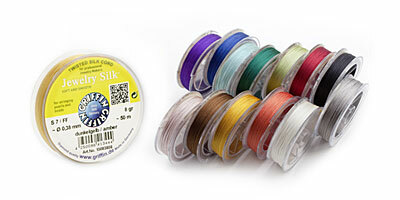 The Griffin Jewelry Silk is a tightly twisted 3-ply filament silk cord with no lint or broken filaments. It is widely available in cards as a 2-ply cordon version with a needle attached, but in the card form the putout is only 2 meter (79 inches) long. Learn how to make your own 2-ply cord with Griffin Jewelry Silk on spool or use this cord just as is for many applications requiring high quality silk. 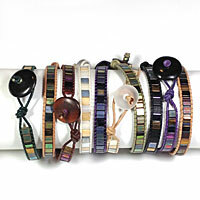 Saturday, April 21, 2012 - BEAD BAZAAR - DIY Supplies & Demo! 10th & Broadway, Downtown Oakland, from 10 am to 6 pm. Print this newsletter for a $2.00 off the $7.00 admission! 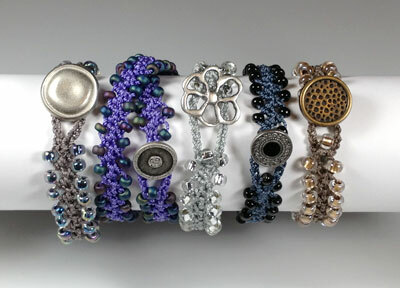 Come by, for a demo on the Tila Bead Leather Wrap Bracelets, plus you will be able to see all the latest kits, the full collection of C-Lon Bead Cord & Thread in person and much more... This show is over. 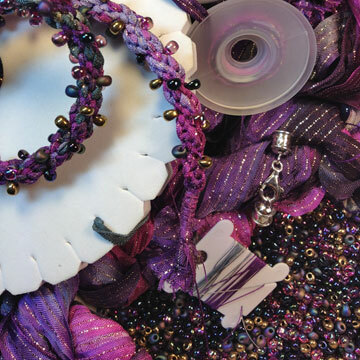 Save the date - Nov 3-4 for for BABE 2012, the next bead show in the Bay Area! 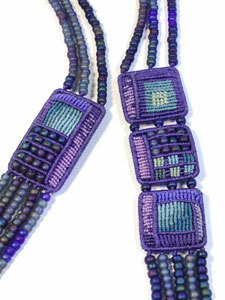 Visit MacrameCollective.Com, it is the newest website on Macrame as an art form. You are in for a treat! All the ribbon are hand dyed one skein at a time by an artist in New York State. 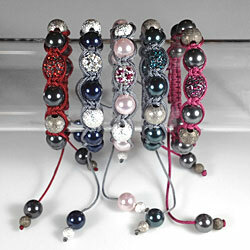 Chinese Knotting Cord - NEW COLORS ! Chinese Knotting Cord is the best material to use many types of Chinese and Asian knotting and for Shambala style square knot bracelets. The braided nylon cord is fusible, so the ends can be burnt. It is durable and it has just enough grip and body to knots well. On the minus side, dye lot variations are so large at times that it's not even the same color, making it hard to match colors. These hurdles can be overcome with proper planning and overlooked as this material is truly unique. Make sure to check the new colors!